Seminars for both the white and red wines of Campania were given on the same day. I attended the seminar on the white wines but was unable to stay for the red wine seminar. However, I was able to taste and drink the red wines at the dinner held at Del Posto and at the walk around tasting that was held between the seminars. It was very interesting to be able to taste wines from some producers that I did not know. Aglianico:-this is a black late ripening grape, which may have been brought to Greece by the Phoenicians. The Ancient Greeks then introduced it into Southern Italy and it took root in the regions of Campania and Basilicata. Aglianico is mentioned by Pliny the Elder (d.79 AD) in his Natural History. It may be one of the grapes used in Ancient Roman’s most famous wine Falernian. Aglianico, along with Nebbiolo and Sangiovese, are often ranked as the three top grape varieties in Italy. See Jeremy Parzen’s http://dobianchi.com/2008/01/29/aglianico-ellenico/ excellent article on how Aglianico got its name. Taurasi, made from Aglianico (Campania), is one of Italy’s great wines. They can last many years. Recently I had wines from the 1958 and 1968 vintage and they were wonderful. Piedirosso – means “red foot” in Italian because the bottom of the vine has a red-colored triple-branched stem like a dove’s foot. In the local dialect it is also know as Palombina (little dove) and Pere’e Pallummo (dove’s foot). Nicholas Belfrage in his book “Brunello to Zabibbo” says “…Piedrosso is a very ancient grape and may be identical to the Colombina mentioned by Pliny.” He also says that Piedirosso is related to the Refosco from Friuli. I really enjoy wines made from 100% Piedirrosso. They are fruity with aromas of plums and cherries and a hint of spice. These wines are inexpensive, well under $20 and worth the effort to find. Quintodecimo Terra d’Eclano Aglianico Irpinia DOC Made from 100% Aglianico. The soil is clay and tufa. There are 5,000 vines per hectare and the harvest is from the middle to the end of October. The maceration period is about 20 days and malolactic fermentation takes place naturally in barriques. The wine spends between 18 and 24 months in new barriques depending on the vintage and another year in bottle before release. I believe the winery is organic. This is a full-bodied wine with aromas of tobacco,cassis and leather. 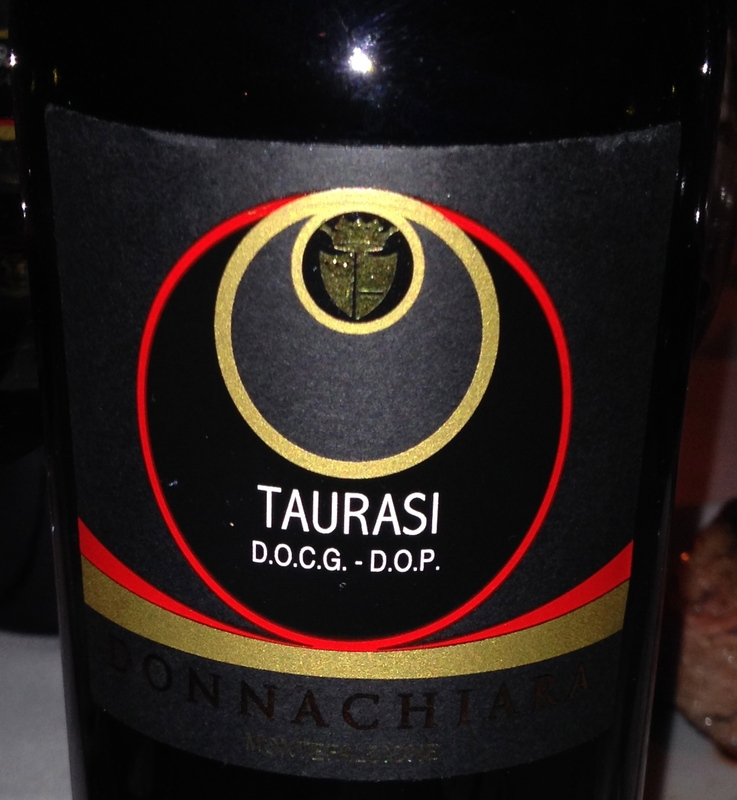 Taurasi DOCG 2009 Donnachiara 100% Aglianico coming from the 20 hectare estate vineyard Torre le Nocelle. Ilaria Petitto from the winery said that all of Donnachiara’s red wines are made from grapes from this vineyard. The soil is volcanic, the vines are 30 years old, the training system is Guyot and there are 4,000 plants per hectare. Harvest takes place the first week of September. The grapes are not destemmed or crushed prior to pressing and there is no filtration. The wine is aged for 12 months in 225-liter French barriques, and 24 months in bottle before release. This is a big complex wine with berry aromas and flavors, hints of cherry and plum and a touch of cacao and coffee. Terra di Lavoro Roccamofina IGT Made from 80% Aglianico and 20% Piedirosso. The Gaiardi Estate produces only this wine. The vines are planted in volcanic soil and there are very low yields. The training for the vines is spur-pruned Cordon, there are 1,800 plants per hectare, the vineyard is at 1,485 ft. with a western exposure. The alcoholic fermentation takes place in stainless steel for 20 days. Maceration lasts for 14 days with pumpovers. The wine is aged in French barriques (225 liters) for 12 months. 70 of the barriques are new and 30 are second passage. The wine remains in bottle for 12 months before release. This is a full-bodied wine with aromas of berries and plums and hints of licorice and coffee. The wine was aged in new barriques but I did not pick up any of those international aromas and flavors. 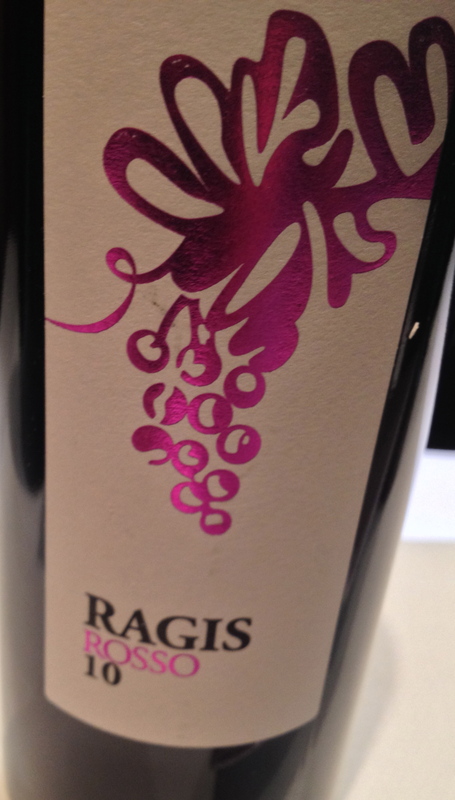 Ragis- Made from 80% Aglanico and 20% Piedirosso La Vigna Di Raito. The soil is shallow and mostly sand on a chalk rock layer. The Aglianico vines are cultivated on Guyot espalier and the Piedirosso on pergolas, a system characteristic of the Amalfi Coast. The exposure is south-southeast and there are about 3,500 plants per hectare.There is separate vinification for the two grapes in stainless steel vessels for over 15 days under controlled temperatures. Malolactic fermentation takes place in barrels. The two wines are transferred into 500 liter French oak barrels and blended. They remain here for 12 months. Then the wine spends another 12 months in bottle before release. It has the power of the Aglanico with the aromatic hints of the Peidirosso, which makes it an elegant wine with a lot of body. This is the first time I have tasted this wine. 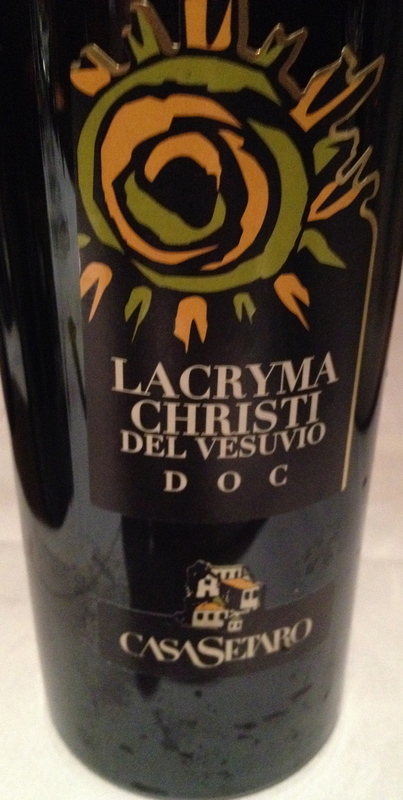 Lacryma Christi di Vesuvio Rosso Casa Setaro Made from Piedirosso 85% and 15% Aglianico. The vineyards are at 220-350 meters and the manual harvest takes place at the end of October. The vines are15-25 years old and the training system is guyot and pergola Vesuvian. There is a soft pressing of the grapes and temperature controlled fermentation. Racking takes place with pneumo-pressing. Maturation is in stainless steel for at least three months, followed by three months in small oak barrels and then aged in the bottle. The wine has aromas of dark fruits, berries and fern, with mineral undertones in the background. On the palate it is full, soft, and fresh.